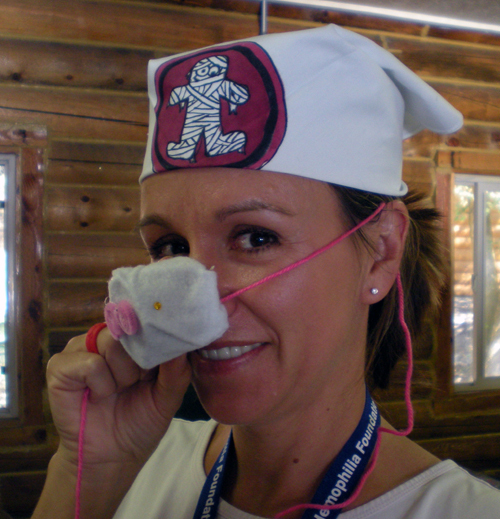 Last week, I got to go spend some time with the super-cute kids at the Utah Hemophilia Foundation summer camp. Of course my partner in crime (and the orchestrator of this whole thing) was wonderful Juli. Here she is holding Amanda so she could nap. Um, forgot the stroller-hello! Amanda loved having a million people hold and adore her throughout the day though. Now I will barrage you with pictures of the great work they did. I know it’s a lot, but I just couldn’t help showing you a bunch of the creative ideas these fantastic kids came up with. We had so much fun! What I love most about these masks is that they are made with inexpensive materials, but with the fabric covering they look impressive. Hot glue is really the best adhesive for this project. So this does require a large amount of supervision for younger artists. 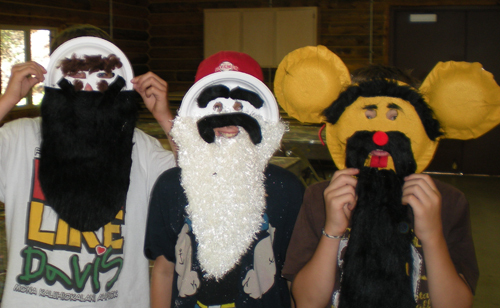 However, they are so fun to make, that many of the adults at the camp had to get in on the action. I will give you a quick run-down on how this is done, but as you can see the sky is the limit with what you can make. Bird: 1/3 plate with 1/4 bowl wrapped in felt for the beak. 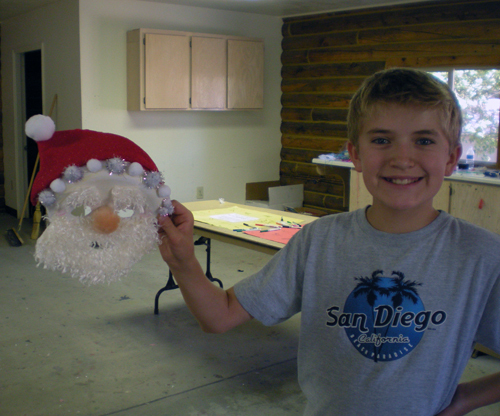 Cover the plate with glue in sections at a time and then arrange with feathers. Start from the outside and work in. 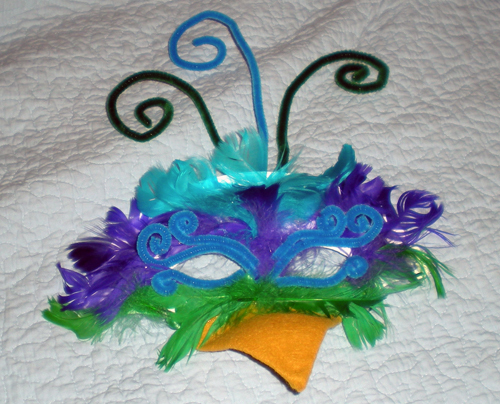 Bend pipe cleaners around the eye-holes and attach to the top for a plume. 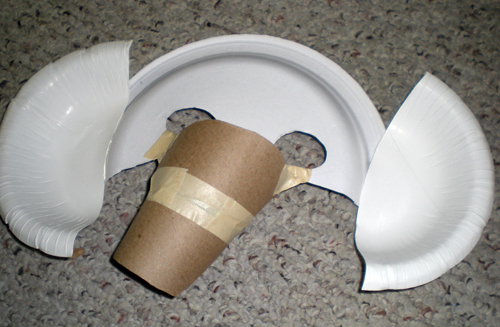 Foundation for Elephant: 1/2 paper plate with 1/2 bowl for each ear. 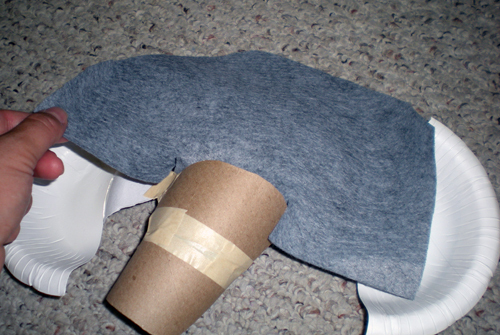 3/4 of a toilet paper tube can be shaped into the trunk. 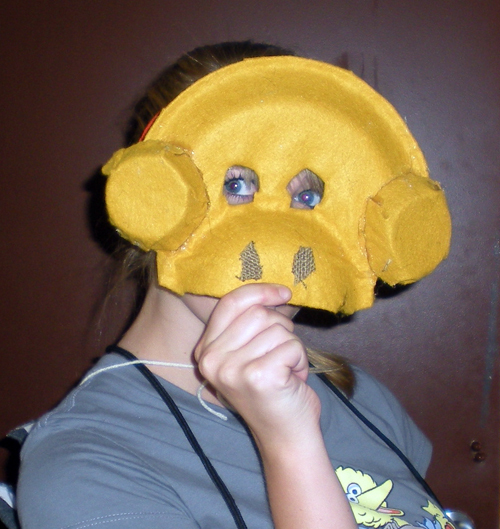 It is a good idea to draw eye holes and hold the plate up to your face to check that they line up with your eyes before cutting. Cut a toilet paper roll in half and shape into a trunk. Use masking tape to securely bond all of the pieces. Now place felt over the mask and cut out roughly the same shape, leaving a about 1/2 inch border to fold over the edge. 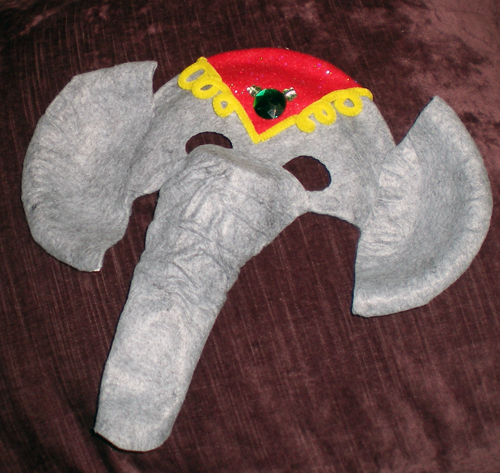 For some masks (such as this one,) you will need to cover in sections. Glue a section around the edge and pull taught, continue gluing until the fabric is completely secure. It is best to glue only around the edges because you can often see a ridge where glue is. This is the finished elephant. I made the wrinkles on the trunk by liberally gluing then pinching the fabric together. 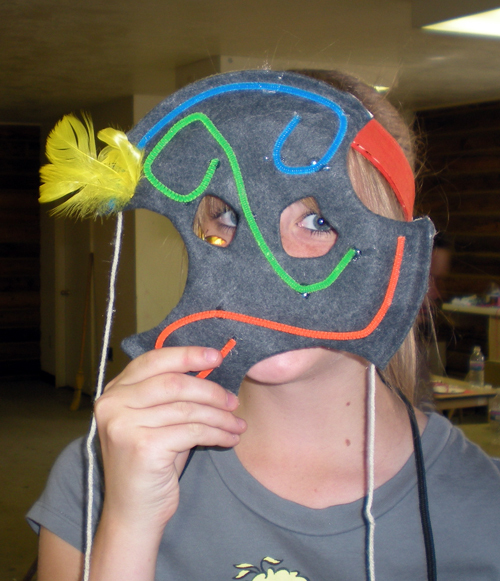 This “Picasso” mask’s designs are made with pipe-cleaners. I love this chicken! The main part is covered in curly faux fur. So clever! The eyelashes on this little piggy just crack me up! 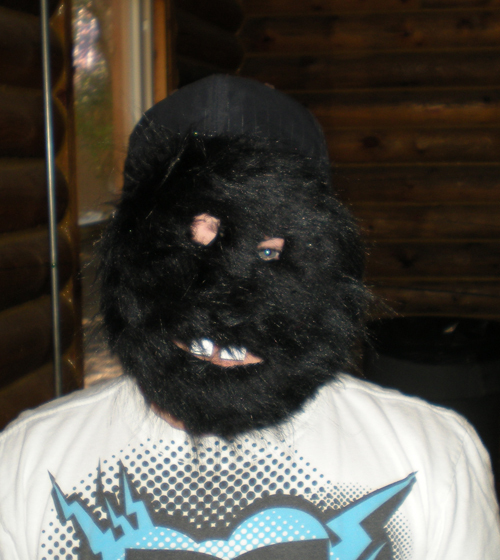 My Mom did this by leaving extra fabric around the eye holes and cutting it into fringe. 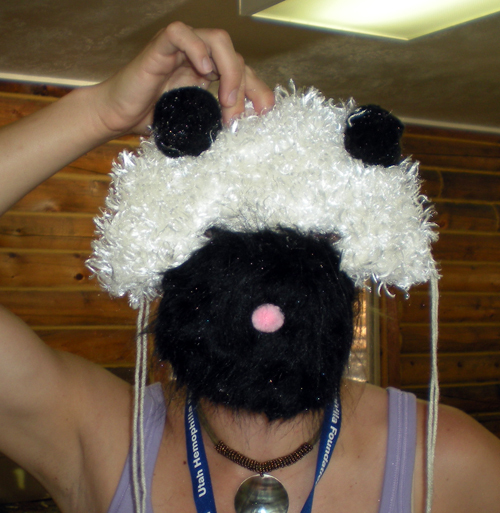 Large pom poms make great ears on this cuddly panda. A bowl is used for the snout. This gorilla has buck teeth which show up even better in person. They are cut out of the original plate (like a jack o’ lantern), then the fur is cut straight across to let them hang down. These 3 old men were almost as funny and cute as their makers. I had to snap a shot of this hound dog half way through as its clever maker ran out of time. I love how he used half of a water bottle to make the muzzle. 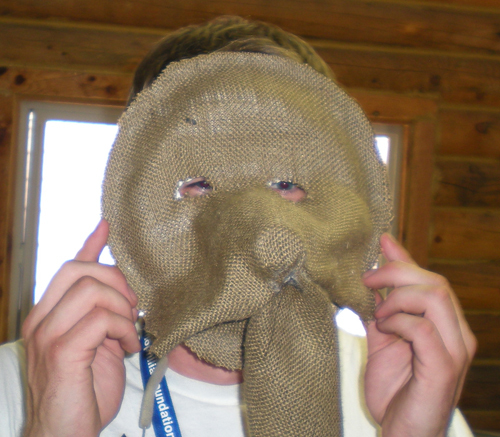 The texture of the burlap is also great and so is the way he used 1/3 of a bowl to make a more prominent forehead. 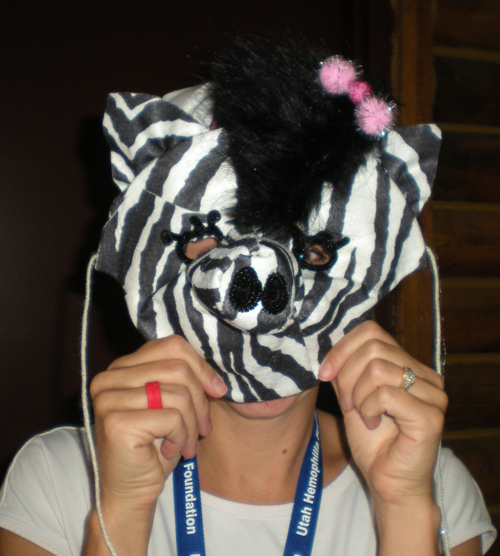 This cute little zebra is made with a faux fur mane that has edges that are folded under to puff it up a little. 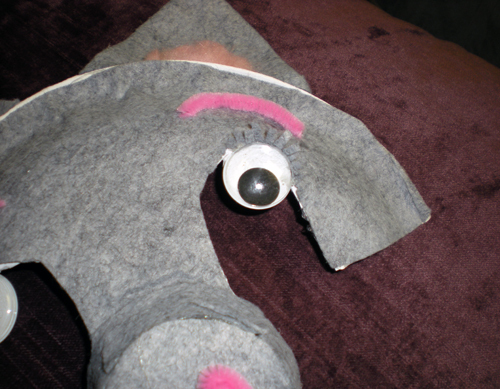 The ears are triangles of felt that were gathered as they were glued on. 1/2 of a bowl for the snout and the bottom of 2 paper cups make great ears on this monkey. This little jeweled snout is made with a little less than a half of a toilet paper roll. Fancy piggy, n’est pas? Share your pics if you try this fun activity! 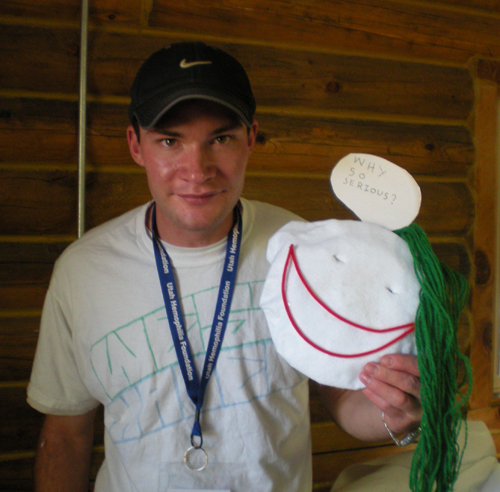 I had a blast, but I think that also had a lot to do with all of the great people at the camp. Oh, these are so fun! I love the elephant and gorilla. I love the gorilla. It reminds me of Andrew. Is that weird to say? The chicken is awesome too! What a neat thing to be involved with! 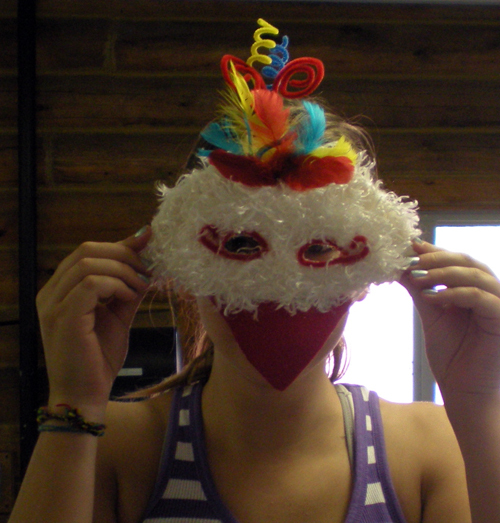 Looks like everyone enjoyed making their masks!